Renal arteriography is a special x-ray of the blood vessels of the kidneys. This test is done in the hospital. You will lie on an x-ray table. Health care providers often use an artery near the groin for the test. Occasionally, the provider may use an artery in the wrist. Clean and shave the area. Apply a numbing medicine to the area. Place a needle into the artery. Pass a thin wire through the needle into the artery. Insert a long, narrow, flexible tube called a catheter in its place. The radiologist directs the catheter into correct position using x-ray images of the body. An instrument called fluoroscope sends the images to a TV monitor, which the provider can see. The catheter is pushed ahead over the wire into the aorta (main blood vessel from the heart). It then enters the kidney artery. The test uses a special dye (called contrast) to help the arteries show up on the x-ray. The blood vessels of the kidneys are not seen with ordinary x-rays. 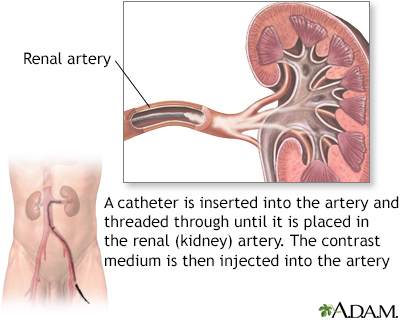 The dye flows through the catheter into the kidney artery. X-ray images are taken as the dye moves through the blood vessels. Saline (sterile salt water) containing a blood thinner may also be sent through the catheter to keep blood in the area from clotting. The catheter is removed after the x-rays are taken. A closure device is placed in the groin or pressure is applied to the area to stop the bleeding. The area is checked after 10 or 15 minutes and a bandage is applied. You may be asked to keep your leg straight for 4 to 6 hours after the procedure. You must sign a consent form. DO NOT eat or drink anything for 6 to 8 hours before the test. You will be given a hospital gown to wear and asked to remove all jewelry. You may be given a pain pill (sedative) before the procedure or IV sedatives during the procedure. You will lie flat on the x-ray table. There is usually a cushion but it is not as comfortable as a bed. You may feel a sting when the anesthesia medicine is given. You may feel some pressure and discomfort as the catheter is positioned. Some people feel a warm sensation when the dye is injected, but most people cannot feel it. You don't feel the catheter inside your body. There may be slight tenderness and bruising at the site of the injection after the test. Renal arteriography is often needed to help decide on the best treatment after other tests are done first. These include duplex ultrasound, CT abdomen, or a CT angiogram. These tests may show the following problems. Acute arterial occlusion of the kidney is a sudden, severe blockage of the artery that supplies blood to the kidney. This test is often used to examine donors and recipients before a kidney transplant. The result determines the number of arteries and veins on each kidney. Results may vary. Talk to your doctor about the meaning of your specific test results. Renal angiography may show the presence of tumors, narrowing of the artery or aneurysms (widening of the vein or artery), blood clots, fistulas, or bleeding in the kidney. Renal cell carcinoma is a type of kidney cancer that starts in the lining of very small tubes (tubules) in the kidney. Some of these problems can be treated with techniques done at the same time the arteriogram is performed. Angioplasty is a procedure to open a narrowed or blocked blood vessels that supply blood to your kidneys. A stent is a small, metal mesh tube that keeps the artery open. It may be placed to keep a narrowed artery open. Cancers and noncancerous tumors can be treated using a process called embolization. This involves using substances that block blood flow in order to kill or shrink the tumor. Sometimes, this is performed in combination with surgery. There is low radiation exposure. Pregnant women and children are more sensitive to the risks related to x-rays. The test should NOT be done if you are pregnant or have severe bleeding problems. Magnetic resonance angiography (MRA) or CT angiography (CTA) can be done instead. MRA and CTA are noninvasive and can provide similar imaging of the kidney arteries, although they cannot be used for treatment. Azarbal AF, Mclafferty RB. Arteriography. In: Sidawy AN, Perler BA, eds. Rutherford's Vascular Surgery and Endovascular Therapy. 9th ed. Philadelphia, PA: Elsevier; 2019:chap 25. Duddalwar VA, Jadvar H, Palmer SL, Boswell WD. Diagnostic kidney imaging. In: Skorecki K, Chertow GM, Marsden PA, Taal MW, Yu ASL, eds. Brenner and Rector's The Kidney. 10th ed. Philadelphia, PA: Elsevier; 2016:chap 28. Patel MS, Lumsden AB, Davies MG. Renal artery atheroembolism. In: Stanley JC, Veith FJ, Wakefield TW, eds. Current therapy in Vascular and Endovascular Surgery. 5th ed. Philadelphia, PA: Elsevier Saunders; 2014:811-812. A renal angiogram is a test used to examine the blood vessels of the kidneys. The test is performed by threading a catheter through the main vessel of the pelvis, up to the renal artery that leads into the kidney. 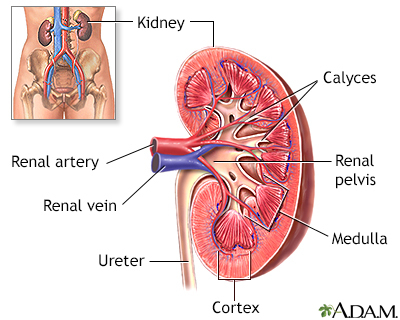 Contrast medium is then injected into the renal artery through the catheter, and images of the vessels of the kidney are taken. The test is a useful aid in evaluating kidney function and diagnosing any narrowing of the arteries, blood clots, tumors, or aneurysms.